Yeast is a living, microscopic, single-cell organism that, as it grows, converts its food (through a process known as fermentation) into alcohol and carbon dioxide. This trait is what endears yeast to wine makers, brew masters and bread bakers. In the making of wine and beer, the manufacture of alcohol by baker's yeast is desired and necessary for the final product, and carbon dioxide is what makes beer and champagne effervescent. The art of bread-making needs the carbon dioxide produced by yeast in order for certain doughs to rise and expand, becoming lighter and fluffier in consistency. To multiply and grow, all yeast needs is the right environment, which includes moisture, food (in the form of sugar or starch) with warm, nurturing temperatures 21–29.5 °C (70–85 °F) best, and with 26–27 °C (79–81 °F) optimal. Within those temperature ranges, warmer temperatures result in faster fermentations, and cooler temperatures in slower ones for both sourdough and baker's yeast breads. As the yeast consumes the sugar and starch in the dough it produces small pockets of carbon dioxide. As the dough bakes, the carbon dioxide expands, and gives the bread its airy texture. The three yeast types commercially available are baker's yeast, brewer's yeast and nutritional yeast. Baker's yeast, as the name implies, is the type used as a leavening agent. Baker's yeast is categorised into three basic types — dry yeast, compressed fresh yeast, and yeast starters. Dry yeast is widely available in at least two forms, active dry yeast and quick-rising, of which the latter takes about half as long to leaven bread. They may be used interchangeably (with adjustments in rising time) and both are available in 1/4-ounce envelopes. Dry yeast may be purchased in 4-ounce jars, larger 1 and 2 lb packages, or in bulk at some health-food stores. It should be stored in a cool, dry place, but can also be refrigerated or frozen. It should always be at room temperature before being dissolved in liquid. Properly stored, it's reliable when used by the expiration date, which should be stamped on the envelope or jar label. 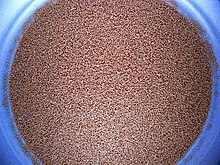 Active dry yeast is in the form of tiny, dehydrated granules. The yeast cells are alive but dormant because of the lack of moisture. When mixed with a warm liquid (40° to 46°C / 105° to 115°F), the cells once again become active. One package of active dry yeast is equal to 1.8 teaspoons[note 1] dry yeast or 1 cake of compressed fresh yeast. Instant yeast is a form of dry yeast similar to active dry, but the granule size is slightly smaller. It has a useful property, it doesn't need to be pre-dissolved with warm water thus it may be mixed into dry flour before adding water. Osmotolerant yeast is also supplied in the form of dry instant yeast, although it is a little more difficult to obtain. It is used as an alternative to increasing the inoculation in doughs that contain a lot of sugar which otherwise causes sluggish or arrested growth. Compressed fresh yeast, which comes in tiny, square cakes of about 17g, is moist and extremely perishable. It must be refrigerated and used within a week or two, or by the date indicated on the package. One cake of fresh yeast can be substituted for one 1/4-oz envelope of dry yeast. In the United States, the use of compressed fresh yeast has been mostly replaced by the more longer-lasting active dry yeast. According to Stanley Cauvain who wrote Bread Making: Improving Quality, fresh yeast should never exceed 2.5% of the flour weight to avoid an undesirable yeast flavor in the baked product. A method to control the rising time of any yeast leavened dough is to increase or decrease the inoculation, which is expressed as a percentage of the flour weight. Yeast is portioned by weight, although approximate volumetric substitutions are commonly used. For home bakers, because of the small amount of yeast used to make a single loaf of bread, a scale with an accuracy of 1/100th to 1/1000th g is needed. Multipliers may be applied to either the yeast percentage or weight to adjust for fresh, active dry, or instant yeasts, which are otherwise generally interchangeable with each other, however, there are times when a specific yeast type is desired. In order to keep the rising time roughly equivalent: to use active dry yeast instead of fresh yeast, multiply fresh yeast by about 42%; to use instant yeast instead of fresh yeast, multiply fresh yeast by about 31.5%. To use instant yeast instead of active dry yeast, multiply active dry yeast by 75%. [note 2] To convert in the other directions, divide instead. All baker's yeast should be given a test called proofing to make sure it's still alive. To proof yeast, dissolve it in warm water and add a pinch of sugar. Set the mixture aside in a warm place for 5 to 10 minutes. If it begins to swell and foam, the yeast is alive, active and capable of leavening bread. If this yeast is then used in a dough, it is a type of yeast starter. Yeast starters are not actually a form of yeast, but instead indicate a wide variety of processes whereby a small amount of yeast is used to inoculate water mixed with a food source such as malt or flour or other sources of sugar or sugars (saccharides). Both bread bakers and brewers use yeast starters: these are basically techniques of growing larger amounts of the freshest, pure yeasts from a smaller inoculation. Baker's techniques may include the growing of yeast as a beer brewer might, and historically did before the mass production of baker's yeast, but today usually refers to what are called sponges, mixtures of water and flour of various hydrations inoculated with an unusually small amount of baker's yeast. These are carefully managed with temperature over time and, beyond their yeast multiplication effect, also are practiced for their beneficial enzymatic effects on the starch and protein matrix, all leading to improved flavor and other desirable characteristics in the baked product. Brewer's yeasts are special non-leavening yeasts used in beer making. Because it's a rich source of B vitamins, brewer's yeast is also used as a food supplement. It's available in health-food stores. Brewer's yeasts are also marketed in specialty beer making equipment shops, with different strains used for different beers. Historically, top-fermenting beer yeast was used for leavening bread. Nutritional yeast, similar to brewer's yeast, is a nutritional supplement popular with vegans and the health conscious, who use it as an ingredient in recipes or simply as a condiment. It is a deactivated yeast, usually Saccharomyces cerevisiae. It is a source of protein and vitamins, especially the B-complex vitamins. It is also naturally low in fat and sodium. Some brands of nutritional yeast, though not all, are fortified with vitamin B12. The vitamin B12 is produced separately from bacteria and then added to the yeast. Nutritional yeast has a strong flavour that is described as nutty, cheesy, or creamy, which makes it popular as an ingredient in cheese substitutes. It is often used by vegans in place of Parmesan cheese. Another popular use is as a topping for popcorn. Some movie theatres offer it along with salt or cayenne pepper as a popcorn condiment. It is commercially available in the form of flakes, or as a yellow powder similar in texture to cornmeal, and can be found in the bulk aisle of most natural food stores. In Australia it is sometimes sold as "savoury yeast flakes." In Canada it has been known to be called "good tasting yeast." Nutritional yeast is different from yeast extract, which has a very strong flavour and comes in the form of a dark brown paste. Other species of yeast are used for making beer, wine, and bread. Wild yeast spores are constantly floating in the air and landing on uncovered foods and liquids. No one's sure when these wild spores first interacted with foods but it's known that the Egyptians used yeast as a leavening agent more than 5,000 years ago. Wine and other fermented beverages were made for millennia before that. Today, scientists have been able to isolate and identify the various yeasts that are best for wine making, beer making and baking. ↑ The USDA National Nutrient database reports a packet of active dry yeast weighs 7.2 g, and a teaspoon of it, 4 g. 7.2 ÷ 4 = 1.8. ↑ The derivation of 42% is from the USDA National Nutrient database. They report that a cake of compressed yeast weighs 17 g, and a packet of active dry yeast, 7.2 g. 7.2 ÷ 17 = 0.423529412 ≈ 42%. Active dry yeast is widely reported to contain 25% dead yeast cells which instant yeast does not have, so 100% - 25% = 75% and 42% * 75% = 31.5%. This page was last edited on 23 December 2014, at 02:39.